BABYGYM Helps Fathers Connect With Their Newborns! BabyGym is a speculative, tongue-in-cheek product that casts a critical but constructive eye on fatherhood. Through his thesis work, GENTLEmen: Challenging Adults to Raise Feminine Boys, Andrew Schlesinger investigates the restrictive nature we place on men to conform to a masculine ideal that can be destructive to themselves and to those around them. The overarching initiative of his thesis is to challenge the influential adults in boys’ lives to rethink the stereotypes they project onto boys, and, instead, encourage traditionally feminine traits. With BabyGym, Andrew hoped to find tools to help encourage new dads to bond with their infants, and break a cycle where men are exempt from the nurturing and caring phase of parenthood. As he interrogated the relationships deeper, the subject appeared to rife with deep cultural barriers and taboo. So he proposed a piece of critical design with BabyGym to question our norms and expectations. Can we encourage dads to spend more time and bond with their newborn child? "How did I arrive at this question, 'Can we encourage dads to spend more time and bond with their newborn child?' In class we started off by writing two speculative futures—a dystopian and a utopian story based in the year 2075. Our stories were to evaluate and criticize what would happen if our thesis goals were taken to the extremes (here, my goals of GENTLEmen and raising boys with more feminine traits.) Next, we moved forward with either dystopian or utopian scenarios to develop a newspaper print that captured the social, political, economic, and cultural conditions of the time. Additionally, we created an advertisement for a product in the story. "In 2075, the product I proposed was the Babymaker, an external uterus that can be worn by either men or women to produce a child in vitro. Given the need to manage the population and steadily grow, this product was regulated by the government—dictating the support of men by requiring that they wear it. My future state was one where men needed to be nurturing for the sake of humanity. While I intended the sketch to be satire—the slogan 'Never touch your baby again!' aligned with the male fear of intimacy. "Returning to the present day, I would need to design an artifact that would either move society closer to that future, or push society in the opposite direction. So, my goal became 'How can we ensure that dads will be nurturing in the near-term, so that we don’t have to demand it in the future?' We dove into sketching concepts, and one particular drawing got a very strong reception from everyone I showed it to. While I intended the sketch to be satire—the slogan 'Never touch your baby again!' aligned with the male fear of intimacy. 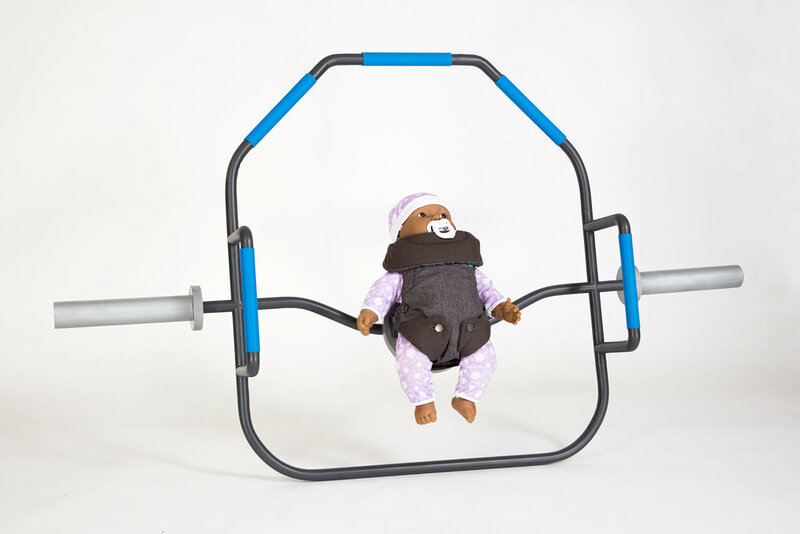 But when observers saw a dad exercising with his baby as the weight, the name BabyGym became obvious. I went on to iterate around the idea of harnessing a baby as the weight for a series of formal exercises. 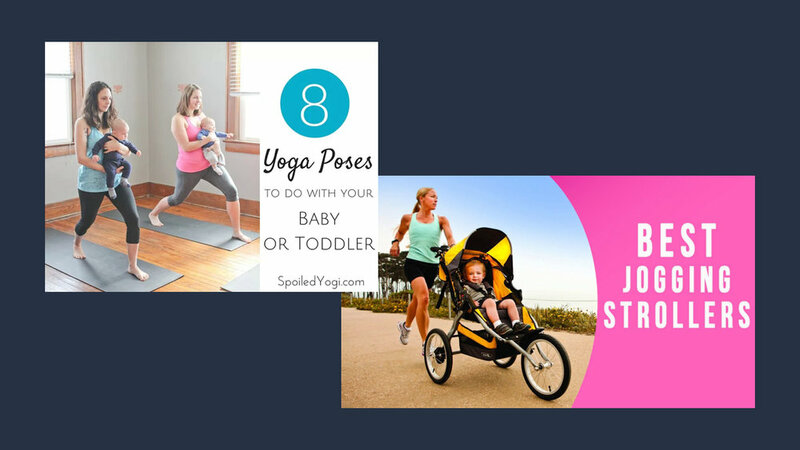 "There are lots of precedents for moms and infants to exercise together [see below], so BabyGym seemed like a plausible—if undesirable—fit. "High fidelity renderings led us into the last phase of product development—final model production. 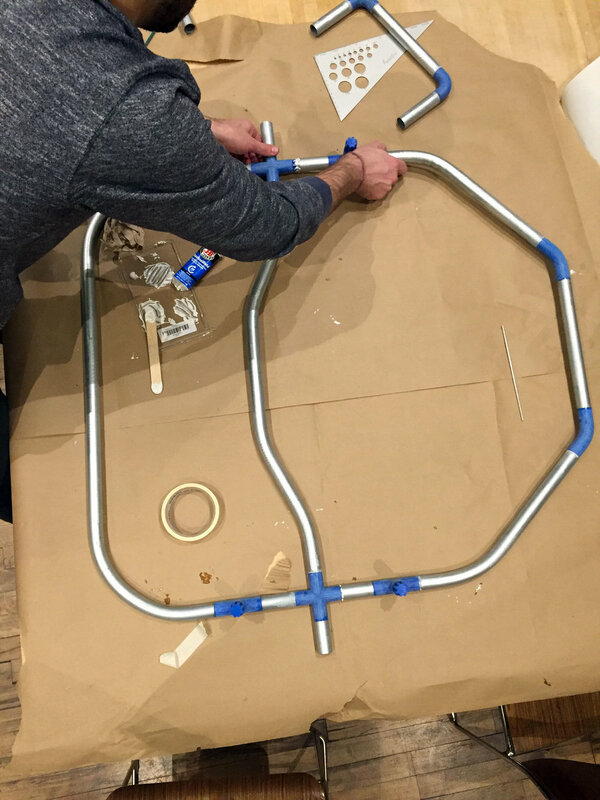 Since I didn't have skills or close access for metal working, I combined EMT conduit with 3D-printed joints to create all the bends and connections to match the 3D model I rendered. "From the start, I have had—and continue to have—conflicting feelings about this product. While I see this object as critical (in fact, outrageous), it’s actually not too off-base. At the heart of the challenge in connecting fathers with their newborns is discomfort. Fathers prefer to stay in their world, while mothers create a new, separate space with the child. BabyGym is a reflection of this separation and attempts to bring the baby into a 'dad’s world.' The gym space is certainly playing off a male stereotype, and the product, both in form and in brand, takes traditional masculinity to the extreme as a means to question it.